For several weeks now, I’ve contended with the Spirit of God dealing with my heart about the message of hell. 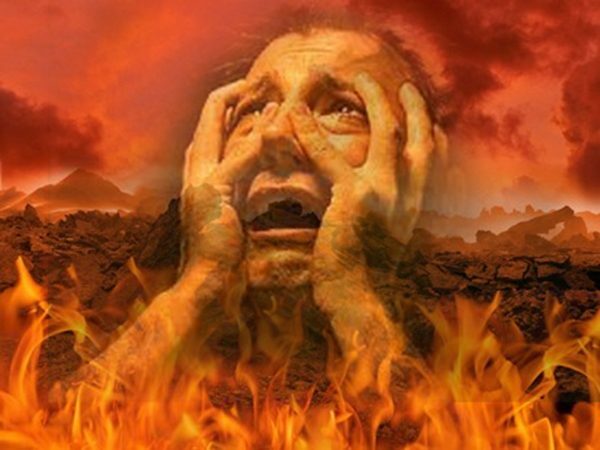 As Christians we preach, teach and sing of the splendors of Heaven and eternity with Christ, but do we also have the same passion to tell men that although hell was never made or intended for man, many, in fact most will spend eternity in that dreadful place? Yet the American pulpit does not warn. It largely stays silent about this more than uncomfortable topic. I received a vision last night, which came on the heels of sensing the Lord telling me to start warning people, and a conversation I had with one of my closest friends, who is not a professing Christian. After this conversation, talking about end times and the return of the Lord and eternity, I was literally grieved in my heart because there appeared to be no urgency in the man nor fear of what may face him. There seemed to be an odd dread as I laid my head on my pillow last night. A strange sense of fear seemed to grip me that was very unusual. Being a Police Officer for many years, I was somewhat accustomed to dealing with my own fear, often having to run directly into a situation that others were fleeing away from. The entire vision and all that I saw was amazingly detailed, but I do not have a sense at this time to share everything. I will point out some of what I saw, felt and heard. First, it is absolutely a place, as described by Jesus, of “outer darkness”. It is a place completely devoid of hope, completely absent of light. The fires and the smoke could be seen literally, and the screams and cries of torment and fear could be heard literally. I saw men who had given themselves to pleasure and perversion who were now reaping the rewards of their earthly deeds, yet without satisfaction. I saw and experienced the fear and torture of knowing that the place where you now dwelt was your eternal destination and without recourse. I saw gangs and those who held tightly to racism reaping the rewards of their hatred and murder. I saw demons tormenting those who had ended up in this place. I saw people desperately trying to escape, trying just to move, to change the outcome, but knowing deep in their heart there would be no escaping. I saw the endless cycle of what appeared to be another day (without light or time), another struggle, another torment and that without remedy. It is impossible to adequately describe the sense of ALL hope being gone FOREVER. It is impossible to capture with words the KNOWING that you have entered your eternity and it will be forever and it will be godless and it will be without light, without hope, without loved ones, and without escape! I remember grabbing my head in fear and panic, which felt like inescapable insanity. I remember seeing others, some who were famous, and most of them could not fathom that they ended up here. “THIS is not LIFE, THIS is not life AT ALL!! “… depart from me, I never knew you”. (From Matthew 7:23). Jesus is clearly indicating His own (self-proclaimed) followers / Christians were not doing the will of the Father, and “practicing lawlessness”. I pray that through the coming Judgment (arriving on this side of eternity) that many — especially Christians — would do a serious check-up from the neck-up and humble themselves to see if they are really in the Faith once delivered to the Saints. repentance is needed from ALL of us, and especially from within the Church and body of believers. Almost all the accounts I’ve read about the nether world leave me with a sense of dread and heaviness. I know how Great a Salvation God has given me and I reflect often about those 10 or so years as a young man when I almost died in so many ways/events, that I cannot fathom the thought of what if-I had not been preserved by God? The isolation, pain and torment of all the Hell testimonies are so heavy, and to think, if it wasn’t for God’s great mercy; I too would have been there. But what anguish to think of it, what if God had not spared me………Not only is the darkness, pain, fire and torture unbearable, but the thoughts that a man or woman in hell, what they must contend with (never ending)(never ceasing)(no rest day or night) is beyond imagination. I will forever sing God’s praise and testify of His Goodness, Mercy, Grace and Foreknowledge. What a mighty God we serve. Bless the Name of the Lord Jesus for doing all the work of Salvation and for shedding His pure innocent blood as an atonement for all; especially unto the household of faith. Shalom Thank you Father God!!! Thank you Thank you Thank you. Just the other day, we were ministering at the inter-city rescue mission. I was in class with the kids. One boy, in which I have been burdened over for several months now, wasn’t really paying attention. Suddenly, I mentioned Heaven and hell. He asked did I have a picture of hell, I told him, no, but I can draw it for you. I sit down and drew up a tall tower building. I explained to him that each section is designated for different sins. I named some different levels of sins and the torture these people were experiencing. He asked many questions after that. Then I asked him to now let me draw Heaven. I told him of the rewards waiting on us. I spoke of the streets of gold and the waters so crystal clear and you could walk through them and come out dry. I shared all the exotic fruits he would be able to eat. Then I shared with him of the many mansions being built and that God had him, his own perfect place to live. He was shocked! Right now, he has lived in the shelter for over 6 months. He will never forget what hell could be like. Thanks Marty, for sharing. Tonya, When I was in high school in the 1970’s, a film called “Red Asphalt” was shown to Driver’s Ed to scare you straight which it certainly did for me. I could learn from example and did not need to experience the reality to make a decision to avoid a hellish car accident. Showing and telling the truth about driving went out of fashion just as telling the truth to youth of heaven and hell, deeming the subjects too heavy, bleak or scary. Well, guess what? We denied decades of youth TRUTH…withholding Biblical knowledge from those on milk by those mature in the faith. SHAME! Is eternal torment preferable to truth-telling when a person can weigh evidence and make the choice to choose the doorway named Christ and follow him down the narrow road of Glory and through the shepherd’s gate into rest and love in heaven with Father God, the saints and angels? SHAME! You are so on the right track speaking the truth in love! Here, you can choose from about 8 or 9 different POWERFUL sermons that Pastor Charles Lawson has given on the real place called HELL. A year ago on my 55th birthday almost exactly a year ago, I felt so excited to be the number of double grace. I wondered what Father would have in mind. My 50th birthday fell right on Easter, and I thought, “Wow…what will this 50th year bring?” My mom died which is not the gift I would have chosen, but that event of the woman who lived right behind me, and who led our family as a watchman and my best friend has led me on such a long journey of spiritual growth including adding a widow(er) and elderly orphan to my servant’s list. So right on April 24th, my birthday in 2016, I was led to a website which had so many personal visits by people to hell, believers and those lost to sin. I was, like you, so impacted forever by what the truth is about hell and how our churches are not working feverishly to save both the people attending and warming pews and combing the streets, alleys and byways for anyone and everyone who could possibly be rescued from this fate way worse than death. Eternity in darkness without God and love….only torment. I realized that my “gift” from god was to spend this last year broadcasting the message that Hell is real through the website blog Holy Spirit had me start two years ago when I audibly heard, “Write it all down. It’s all important” in 2010. Thank you for your confirmation. I would add your testimony but see it is copyrighted, so hope and pray that many, many will find your words here. We all need to redouble our prayers of mercy that many will turn to God in their last moments, if not before, when His righteous judgements begin. Mary K. Baxter’s accounts of hell and Heaven are quite an account. All of his writing are tremendously supported by Scripture. He is like a walking Scripture encyclopedia, rattling off relevant chapters and verses by memory. Truly amazing! I agree Mary K. Baxter’s accounts of Heaven and Hell are something else. It’s life changing. Thank God for them. “Why do I say ‘workers of lawlessness?’ Because the heart of the law is Love. What you are doing is contrary to that law. You are not building up, making the way straight for Me. You are blowing up bridges and making men captive to your laws and legalisms, immersing them in judgment, self-righteousness and blinding error. “Do I say these things to condemn you? No, I say them to wake you up before it’s too late. You are proceeding in the wrong direction. Come back to Me and teach what I teach, not what your fathers taught you. Many of them walked in serious error and passed that error on to you. Now you continue to pass it on, turning people away from Me. “What I wish for you is to cease from judging others and apply yourselves to My Beatitudes. Many of you have gifts and talents to spread the Gospel: music, art, writing, and teaching. But as long as you are steeped in rancor and jealousy, you are useless to Me. You would only spread bitterness if I increased your anointing.